I had just finished Great Expectations and was looking for something around the same period when I thought of Wilkie Collins. I am more familiar with The Moonstone, and thought I would try The Woman in White. This turned out to be one of my favorite novels I've ever read. What I think is absolutely BRILLIANT about this book is Collins' choice to present the narrative as a series of letters, diaries, legal statements, etc. from multiple characters. You piece together the unfolding mystery from these sources as you go, and each piece itself is somewhat mysterious until it all comes together towards the end when details that were obscure become clear. You are also continually shifting perspective, seeing characters you've met before through another's eyes, or finally getting to hear them speak for themselves. 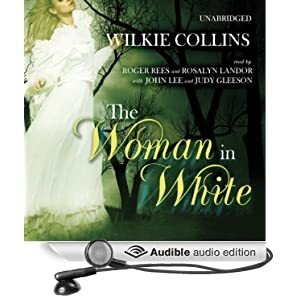 (I listened to this on audiobook from iTunes - the British actor Roger Rees reads Hartright's narratives - and I enjoyed the book even more by hearing the different characters vocally acted out. I HIGHLY recommend this.) The changing of voices in Collins' narrative is so well done that each character has a distinctive style and reflects the prism through which he or she views events: the housekeeper, the widow of a clergyman, refers sententiously to her late husband's sermons; Mrs. Catherick dwells on the details of her expensive watch and gifts given to her by Sir Percival. Elderly Mr. Fairlie has no room in his mind for anything but his hypochondria, and his narration of his disinterest, along with the repeated attempts of Louis to assist, are hilarious in the beginning, and horrifying later on when we realize how much is at stake. The shifting of perspective within the book also means that Collins is able to maximize the suspense within the story: by now we the reader have seen enough of the Count to know his true nature, but are in a housekeeper's narrative in which he is lauded as a kind and saintly man, which leaves the reader horrified, helpless to warn or intervene as evil falls upon the innocent. I remembered maybe a quarter of the way into the book that the story seemed familiar - I had seen a 1997-8 Masterpiece Theater version - but the multiple secrets Collins hints at throughout the plot are only a part of the story, which turns out to be largely the seemingly impossible problem of proving the case legally, and Hartright and Miss Halcombe's efforts to gather sufficient evidence while avoiding detection. So even if the reader is in the position of having privileged information, the drama is in watching the characters suffer and react. If you have had the equivocal fortune to have seen the Masterpiece Theater "Woman In White", please endeavor to scrub it out of your mind. It's a wonderful cast, with Tara FitzGerald (although she was better in "The Tenant of Wildfell Hall") and Justine Wadell (who is better in "Wives and Daughters") and James Wilby ("Tale of Two Cities", "Maurice", "Howards End", etc. ), but the adaptation is terrible, including changing key elements of the plot and relationships between characters. There is also a seedy, degraded, humiliating aspect to this movie, which steals much of the plot away from Hartright and puts it into Marion Halcombe's role, but neither Hartright nor Marion ever forget themselves to this degree. They are champions of virtue, when virtue has been trodden down and looks as if it never will rise again. Marion, Marion, most wonderful of characters, Marion! She is a truly original creation - more so, even, I think, than Count Fosco. It is aggravating to see Hartright leaning on her in adversity, and yet so smitten with her lovely, but far more conventional, half-sister. Laura is brave, but Marion is courageous. Collins often uses "manly" or "man-like" to describe her, and this is probably the best that can be said for such a strong female character in 1859. At least, if Walter Hartright does not appreciate her intelligence, noble character, and courageous heart, Count Fosco, the undisputed genius within the book, sings her praises at every turn as the most remarkable woman he has ever met.